WE ARE NOW FULL - You may sign up for back up. You will only be contacted if you will be filling in for someone that could not attend. @Beth Hall You will be on our back up list. We will be oding this event again. I would like to come to the event. Ms. Toth I am not a property owner, however, I would like to be considered for this event. 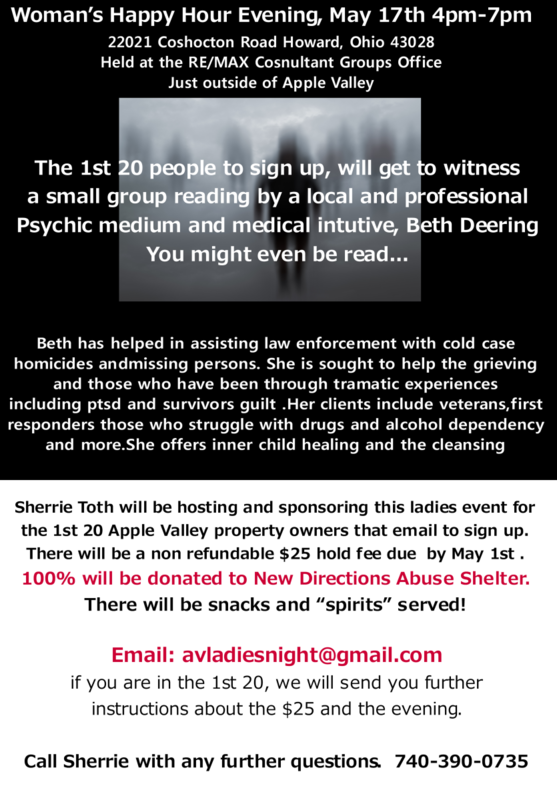 I attended another reading involving Ms. Deering with some of the ladies from Apple Valley before. Beth Shaw, Cheryl Schetzel and Trina Huntsman. May 17th is the 3rd Anniversary of my daughters passing and that is why I am asking. Thank you for your consideration. Sounds like an interesting evening. Thanks Sherrie.